I love to manicure my nails and even do nail arts on them. But every time I reshape my nails I always end up using my available nail files that are made of metal and emery boards. From time to time I have to dispose them and buy another because the longer time I used them it will leave my nails unsmooth. And also, buying nail files from time to time is very costly. How I wish I can find nail files that are hygienic and will last long even with severe usage. Today I came across a website that offers crystal nail files that are of high quality and durability. Mont Bleu nail files are non ordinary nail files they are made of tampered glass from Czech Republic, the leading glass producing country. 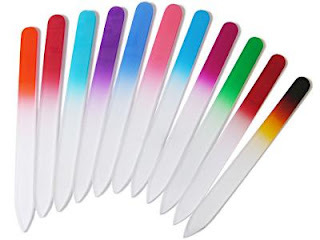 Crystal nail files or also known as glass nail files are very efficient in smoothing and shaping nails, they will never splinter your nails like metal or emery board nail files and most of all they are very hygienic, easy to clean and can be sterilized in various ways. 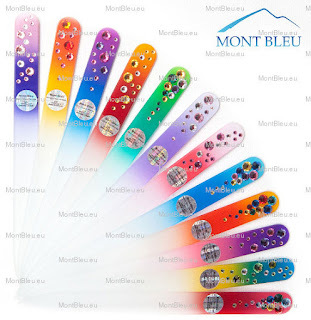 Aside from that, Mont Bleu nail files are very stylish. They offer not only clear and colored glass nail files but also they have wide selection of decorated glass nail files, from hand painted to luxuriously Swarovski Crystals decorated. 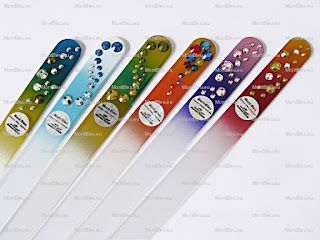 These crystal nail files are not only for manicurist used, but also a very elegant and pretty tool to gift ourselves and to our love ones. aY, sooo cute. If I have nail files like those, I would probably keep them and not use them at all.